Edinburgh to Bangkok overland - Getting Where? The Ulaan Baatar to Beijing New Year train, stopped in Sainshand, Mongolia. 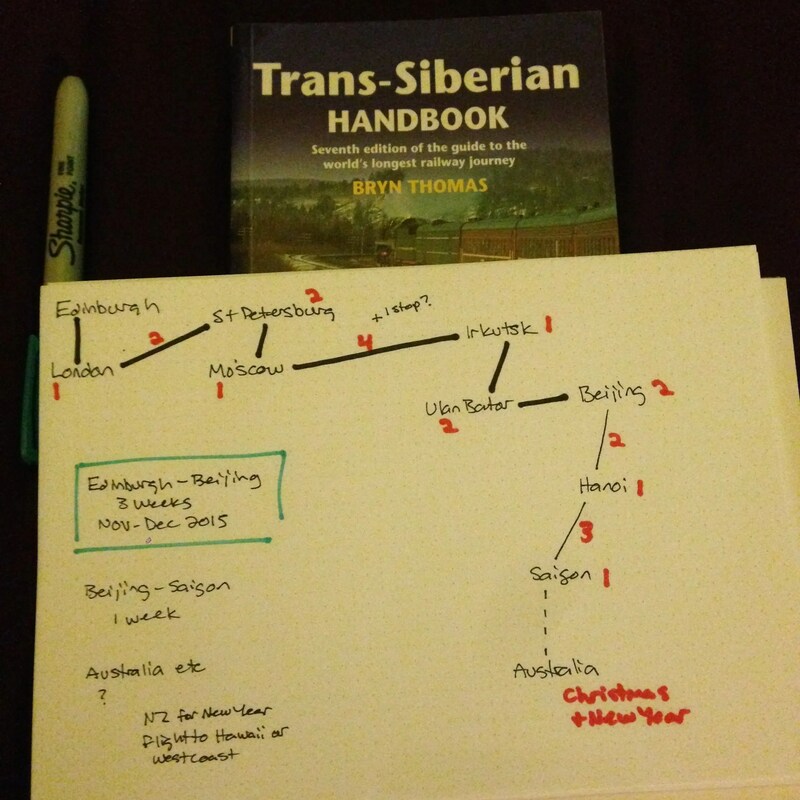 I started this blog to keep track of the run-up to and execution of a huge overland trip anchored on the Trans-Siberian Railway I dreamed about and planned for 12 years. I managed to actually do the thing in Winter 2015/2016. Basically I wanted to get on a train in Edinburgh and just keeeeeeeep going. I’d wanted to do the Trans-Siberian railway for over 10 years. I always had a vague notion of it, but then I saw Ewan McGregor and Charley Boorman’s Long Way Round when I was up late and unable to sleep while spending Christmas 2004 in a hotel in Edinburgh with my family, and I was sold. Every time I watched it I thought: SOON, I WILL DO IT. And sometime in early 2014 I realised I’d been thinking that for a decade. That’s way too long to sit on something without moving. When I was picking a big trip to do for my 30th, I skipped over the Trans-Siberian and chose to go to Africa instead. It didn’t seem like the right time for the big train adventure, and Africa was so different from anything I’d ever planned. I really wanted to see rhinos and as many other animals I possibly could in the wild. I’m so glad I did. That trip did a lot for me. Including kickstart the change I needed to get going on the adventure I’ve been dreaming about for most of my adult life. When I got back, I sat down to start planning the big one for real. (I already had the book for years – a Christmas present from my boyfriend at the time, who knew how much I wanted to go.) It started as a 2-3 week train trip to Beijing. It grew to a slightly more epic 3 month route, plus a plan to leave my job and move out of the flat I’d lived in for nearly 8 years. Rip It Up And Start Again for real. The rules were I was not allowed to fly until I was headed home from the end point. I stuck to trains as much as possible, but I also used long-distance buses, ferries, and all manner of small local transport. Here’s a map of exactly where I ended up going. I booked everything through to Beijing ahead of time, at which point I started booking as I went along, based on a rough plan and target dates to cross into the last few countries (mostly dictated by visa requirements, but also on when I’d be able to go to Lindy socials in various cities). There are quite a few posts covering the preparation for the trip, but here’s an index of everything I wrote while actually on the road, in order.